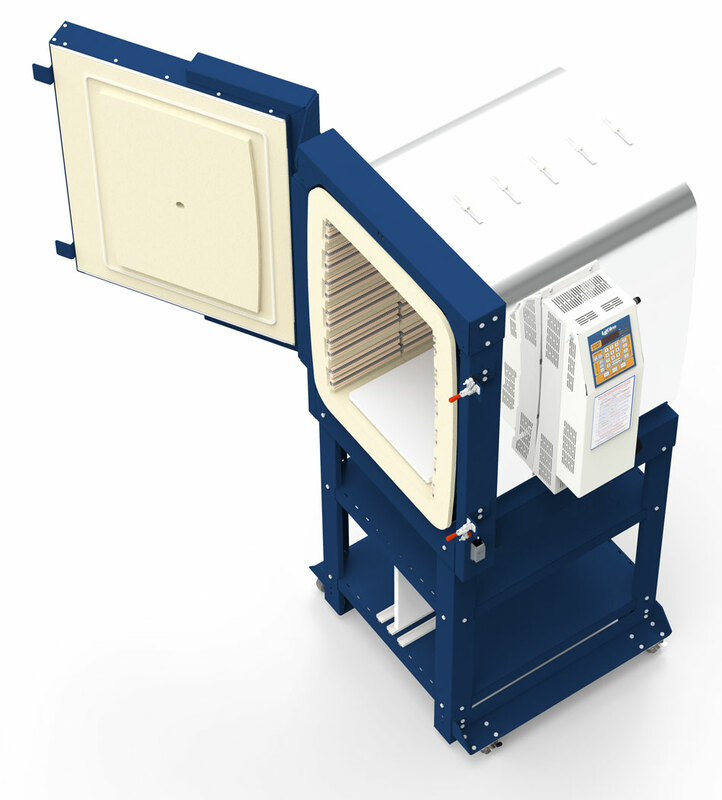 Model eFL1626 Front-Loading Kiln with with Multi-Program Three-Zoned DynaTrol mounted in an easy-open cool-firing piggy-back control panel that is angled for easy viewing of control. 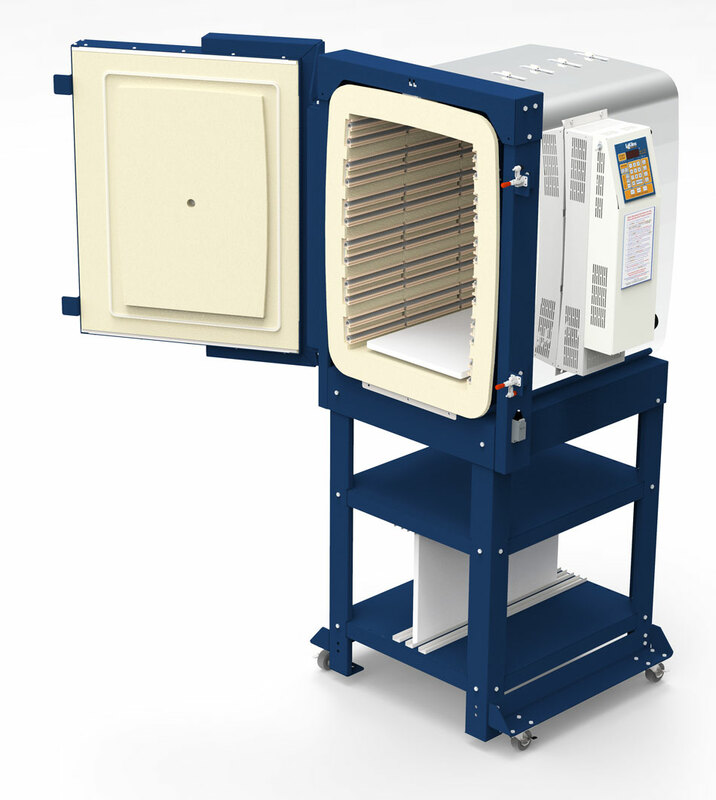 Kiln comes with hard ceramic element holders, thermocouple protection tubes, strong solid-top stand, and solid peephole plugs. The sides and top are arched for super strength. The base, door and door frame are formed from precision sheet metal to be both lightweight and strong. Two shelves provide storage for kiln furniture and structural support. 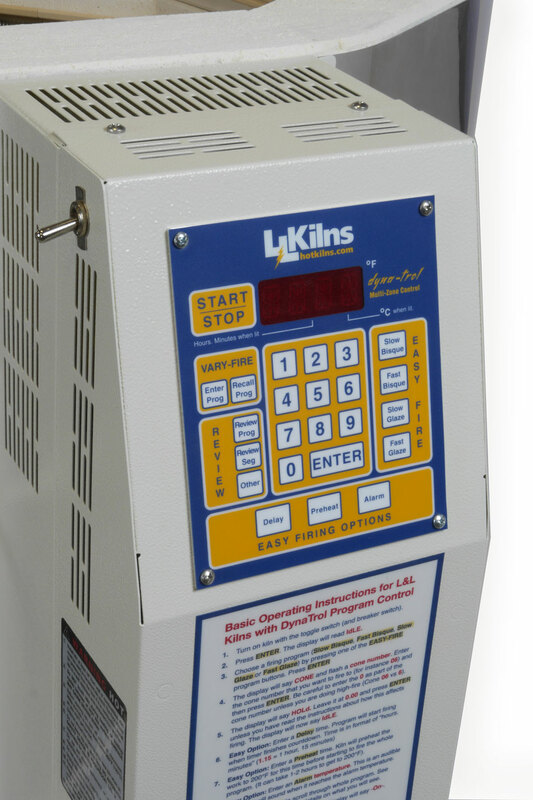 These kilns ship easily by common carrier, are inexpensive to buy, install, and maintain. 17"W by 26"H by 26"D (6.6 cubic feet). 3" K23 brick. NEMA 6-50 single phase or 15-50 three phase 6 foot power cord included on all models except eFL1626-208-X. Cone 10 for all voltages eFL1626-208. 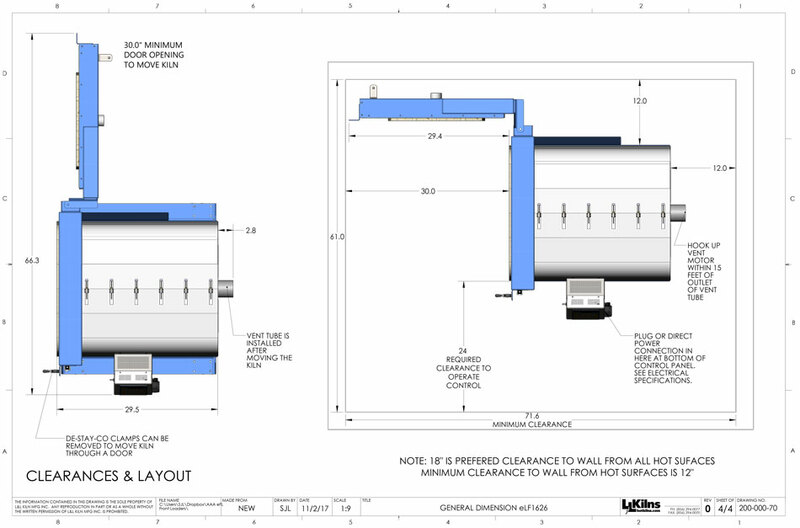 (See electrical specifications for details). See this checklist for shipping. 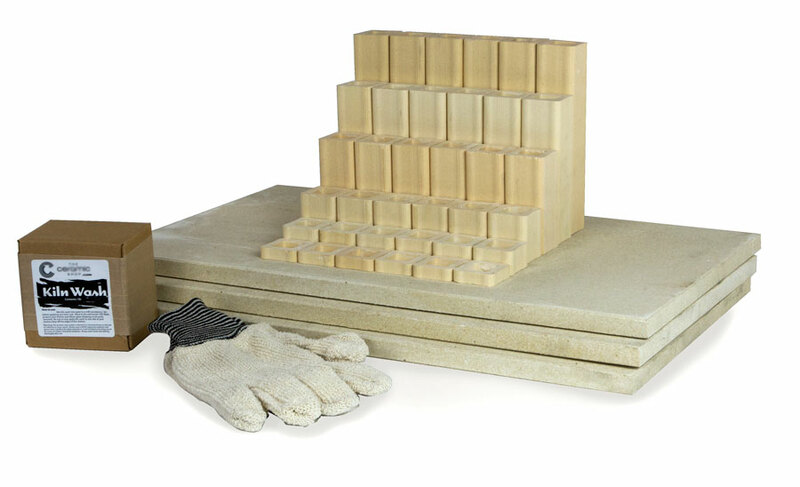 Insulation: 3" (76 mm) K23 Premium Firebrick on sides, back, bottom and top. 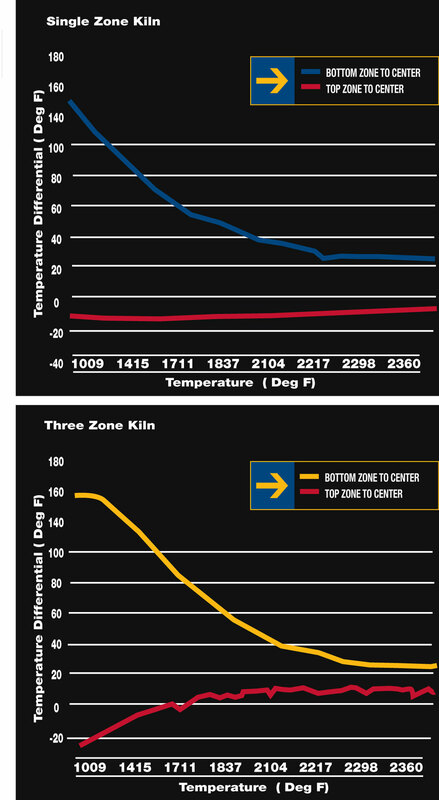 3" K23 plus 1" microporous insulation in door to compensate for having no elements in door. Wire ConnectionA six foot cord with a 50 amp NEMA 6-50 single phase plug. Neutral is not used. Wire ConnectionA six foot cord with a 50 amp NEMA 15-50 three phase plug. Neutral is not used. Construction: Stainless steel wrapped around arched firebrick. There are seven adjustable clamps welded to the casing. Door and door frame are independent and are welded to the base assembly. Stand: Heavy gauge stand with two shelves. Fabricated from precision 14 gauge sheet metal. Levelling bolts and anchor holes included. A built in stainless steel shelf rack and shelf for posts saves space and hundreds of dollars. 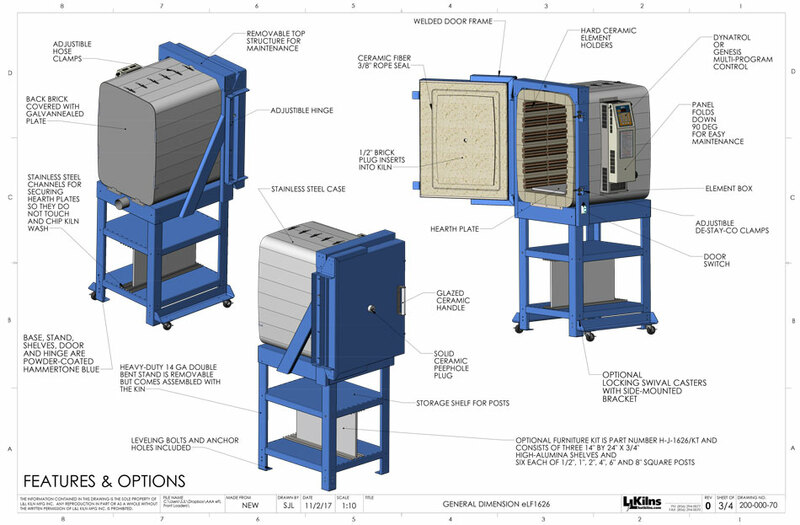 Stand comes assembled in the US and Canada but can be disassembled for compact air shipment. Peephole Plugs: One solid ceramic peephole plug with full 1” diameter. 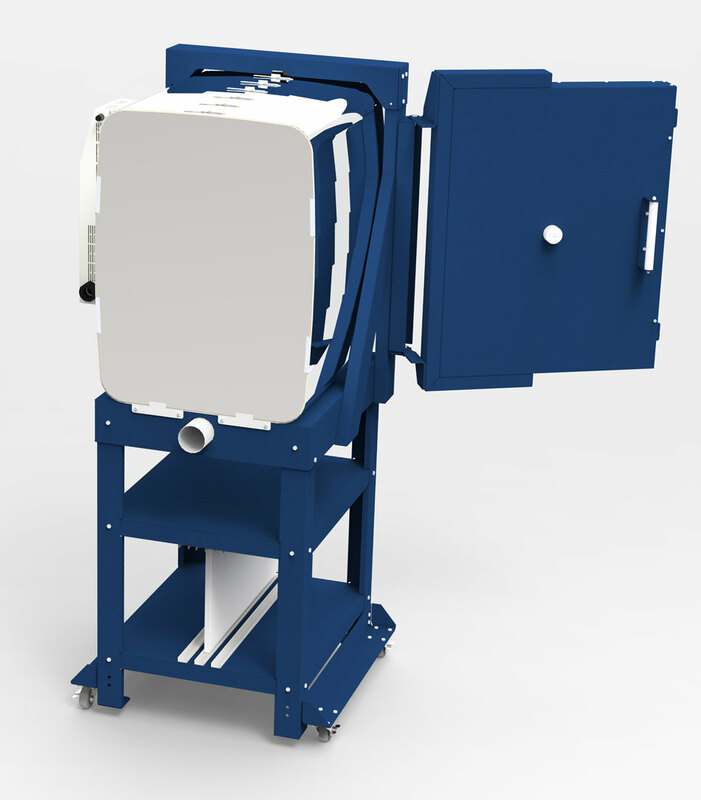 Control Box Mounting: The control panel is angled for easy viewing and operation of the DynaTrol. All controls and components are mounted in a separate control panel that is piggy-backed on top of the element connection box. A layer of insulation and this separation helps keep the controls cool for longer life. The control panel and element box are hinged for easy access and maintenance. 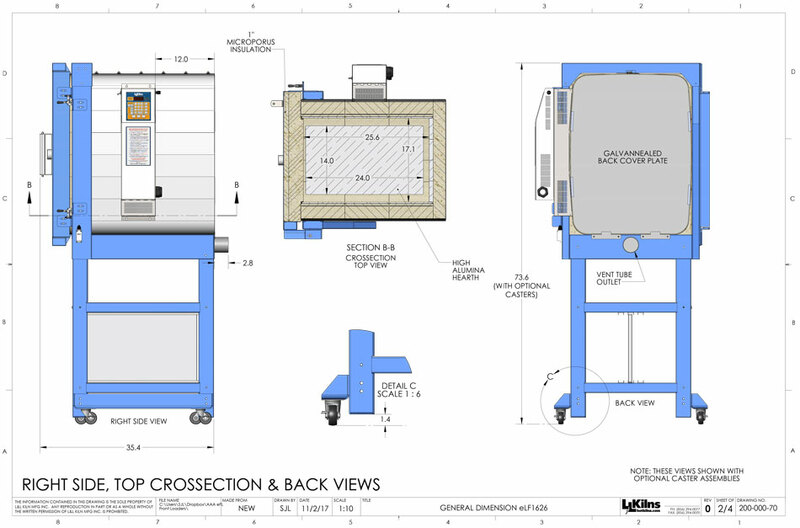 Moreover, when the top control panel is in the open position it rigidly stays in a perpendicular position making servicing safer and easier than with other make kilns. 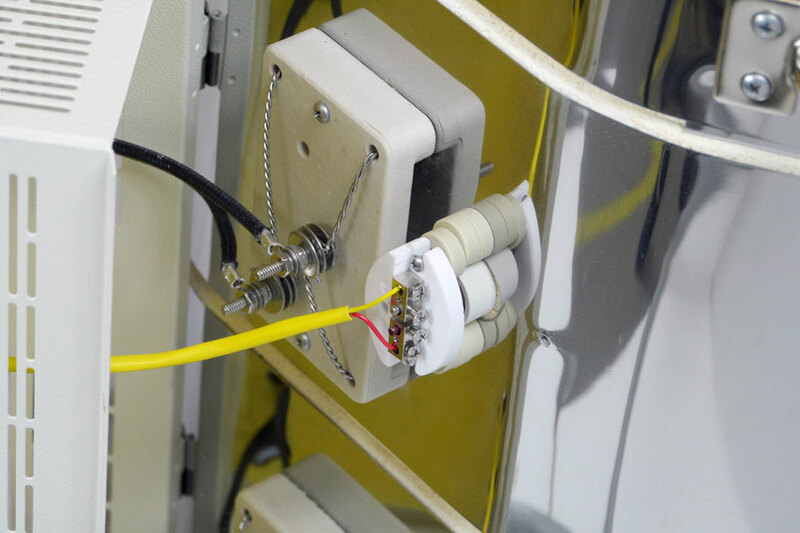 Also the control box can be easily removed for servicing. On/off switch and control fuse are included. More about Easy-Fire control panel. 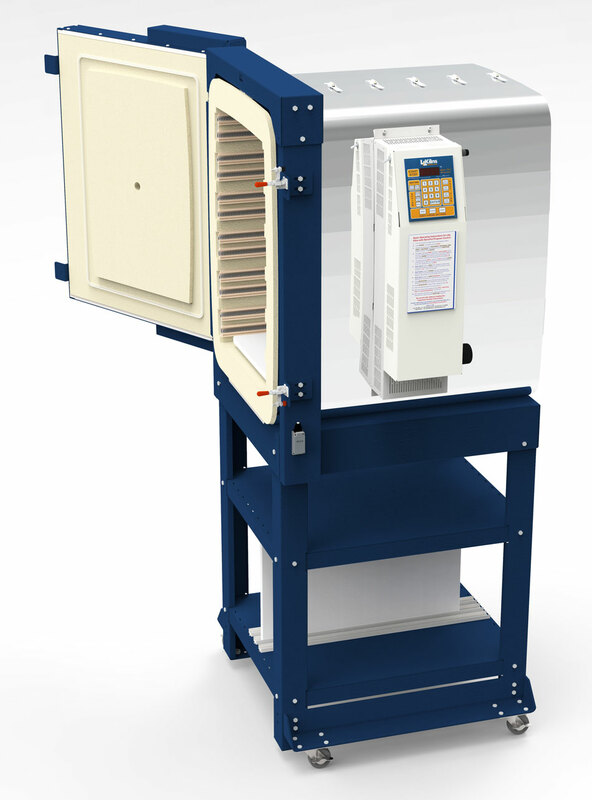 Control Panel Service: Control box drops down perpendicular to kiln for easy access to wiring and controls. All electrical wires are color coded or numbered. The Quad Element System provides a massively robust element for long life under production conditions. Standard on eQuad-Pro and JH Series. Optional on most other kiln series. Remove two screws and a few plug-on wires and the panel disconnects in 5 minutes. 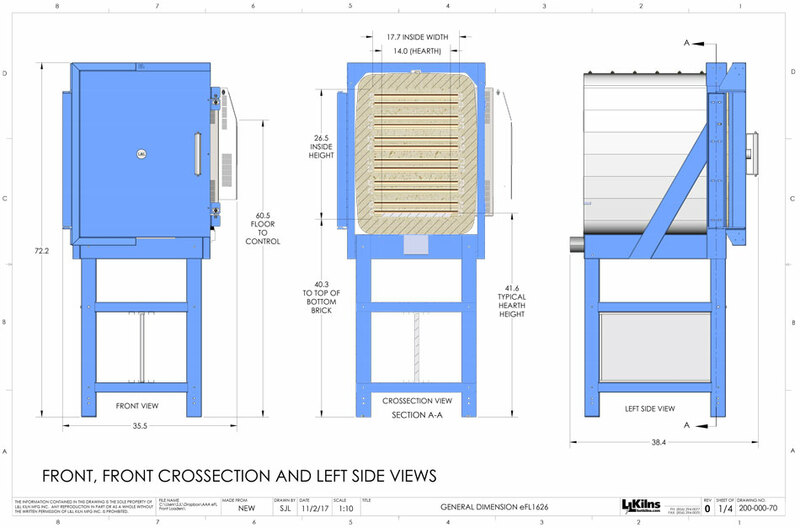 The Vent Doubler allows you to use one vent on two kilns. The multi-mounting bracket for the Vent-Sure Vent allows you mount the vent motor in several different positions. All power is switched off with a 50 amp power switch before the door can physically be opened. (Easy-Fire & School-Master Kilns only).